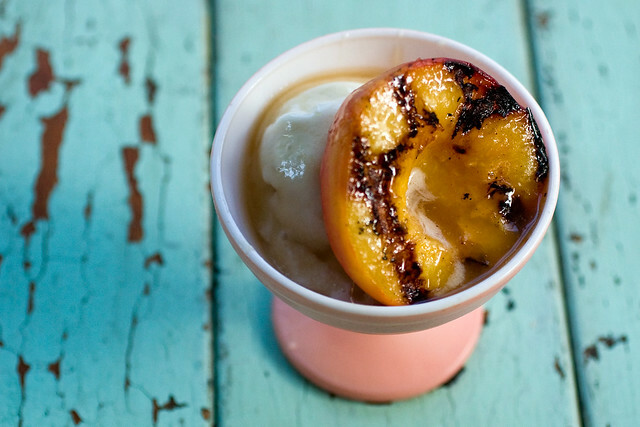 Grilled peaches…everyone is doing it! And why not, who doesn’t love a summer dessert that doesn’t involve turning the oven on? When you grill a peach, or any fruit really, you want the exact right amount of caramelization. Too much and there’s bitterness, too little and it’s just kind of like eating a warm peach. Many recipes call for rubbing the peaches with sugar before grilling, but I think that can lead to grill misfires (pun not really intended, I just got lucky.) I like the method in this recipe because the peach is simply sprinkled with a little lemon juice and oil. Not adding sugar lessens the danger of over-caramelization, an epidemic that studies show affects 4 out of 5 peaches at every barbeque. Instead I rely on the caramel for sweetness, so let’s move on to that since it’s really the reason you’re here. Ginger coconut caramel sauce! This sweet, fragrant, smooth and syrupy sauce is what elevates these grilled peaches to unforgettable. And even if you don’t have a candy thermometer, or if you’ve never made caramel before, this recipe is pretty easy and forgiving. Try to stop yourself from licking the spoon, just try it! No but seriously, I burned my tongue because I couldn’t wait, so you remember to let it cool a bit first! An added bonus is that you’ll probably have a little extra to drizzle over ice cream throughout the week. I’d say that vegan vanilla ice cream is a total must here. I love good old So Delicious soy-based vanilla, but I think that a coconut based one would be a great choice, too. Also, use plain white sugar here. The health-food sugars just don’t seem to work as well in caramels, I’m not sure why. So use beet sugar if you’re concerned about non-vegan filtration processes. In a 2-quart pot, mix together sugar, water and maple syrup. Place over medium heat, and stir with a wisk until the sugar has dissolved. Once dissolved, you don’t have to stir as much, but definitely keep a close eye so that it doesn’t burn, but do stir occasionally. It should be bubbly at the edges and start to turn a few shades darker. If it seems to be bubbling wildly, then lower the heat a bit. Let cook this way for 15 minutes or so. In the meantime, mix the cornstarch with the tablespoon of water and slowly add the coconut milk, mixing with a fork to thoroughly incorporate the cornstarch. Once the caramel turns a deep honey brown, slowly stream in the coconut milk, whisking constantly, then mix in the coconut oil, ginger and salt. Cook for another 7 minutes or so, so that the cornstarch thickens the caramel a bit. Let cool a bit, but serve warm. Preheat the grill to medium-high. Remember to lightly grease it first so that the peaches don’t stick. It’s easiest to slice the peaches width-wise (another way to think about it, is around the waist,) not stem to bottom. The pit will come out easier. Once sliced, hold each end of the peach and twist until it releases. Remove the pit, place peaches in a big bowl, and coat in oil and lemon juice. Use your hands to gently rub them and make sure they’re coated. Grill each peach face down for about 7 minutes. Use a thin metal spatula to lift them from the grill. They should be tender and have awesome grill marks. Flip and grill for another 2 minutes or so, just to soften a bit more. Serve immediately, with ice cream and drizzled with caramel. Oh my….. why on earth did I ever eat peaches sans grilling and coconut ice cream? Naked peaches are forever ruined now! Cannot wait until the next time I bbq to try this! 3/4 what sugar? 🙂 presumably a cup. God… those look and sound amazing! do you have a favorite vegan vanilla ice cream? This sounds awesome! I love trying peaches in new ways. Great recipe! This looks like such a cool, summery dessert! I am sooo in love with coconut at the moment, so that caramel sounds like a total must-try. Plus those peaches look gorgeous! My mouth is watering just THINKING about this nom-tastic concoction! A definite must for the 4th of July weekend! Setting stuff on fire and eating grilled peaches with (ginger coconut) caramel and vanilla ice cream is the ULTIMATE American pastime. Sorta. Well, from here on out it will be!!! I just hope my tummy can wait an entire week for the peaches! I may have to give the recipe a trial run. Considering my less-than-stellar culinary skillz, it may not be such a bad idea, now that I think about it. Oh dear, but where to find good organic peaches…ANYWHERE ELSE it wouldn’t pose much problem; however, I’m sacked up in the nation’s sweaty armpit. Southwest Florida. Where only the criminally insane choose to live during the summertime, and the only produce you have a chance at this time of year are mangos. Except most are from MEXICO because all our locally grown are shipped out of state. My little fruit trees aren’t producing quite yet, either-what’s a girl to do? Apparently get some serious sleep, because this rant will probably embarrass the hell outta me tomorrow. I haven’t even been drinking! Sad, huh-at least then I’d kind of have an excuse. What I was TRYING to say is that this recipe looks buhlicious. P.s. 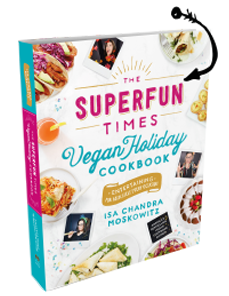 thank you for the godsend that is your cookbook (vegan w/ a vengeance) as I recently rediscovered vegetatianism (working to vegan) after trying to eat meat for nearly two years. I had been a vegan for eight years before that but because of health issues thought I’d give meat a chance-unfortunately, it made things worse. Anyway, Vegan With A Vengeance has been a lifesaver, and I recently got Appetite For Reduction. I can’t wait to try those recipes as well. This little pot of awesome looks absolutely beauteous!!! Drool. Is that the stuff in the 15/16 oz. aluminum cans found on the shelf (Thia Kitchen brand comes to mind)? Or the kind we normally associate which would be the stuff we put on cereal and is usually located with all the other non-dairy milks? It’s the canned stuff. The coconut milk in the carton is called “coconut beverage.” I’m surprised that’s what you associate with coconut milk since it’s a relatively new product! haha….true. I’m relatively new to vegan food so that is probably why I associated that with coconut milk. Btw, thanks for clearing that up. Great blog/website too. Wow. That needs to be in my belly. Right. Now. Thanks for clarifying the coconut milk/beverage thing! I always think of the one that goes on cereal etc. too, probably because I had never used the canned stuff before I bought your books. This recipe looks amazing, as always, thanks for sharing. You are fantastic. Holy Yumminess, Batman! This is the naughtiest looking goody I’ve seen in a while. I will make it this Thursday after getting some peaches at our wonderful farmer’s market! Thank you for sharing! I made these last night, except I used tofutti vanilla ice cream. Its so good! Have you ever tried that kind before? This looks amazing! Im trying the recipe tonight! I made this last night and my hubby liked it so much, he actually licked his bowl clean and dropped some very strong hints that he’d like the same again today. Message received, he’s now devouring another bowl of grilled peaches, stopping every now and again to give me the thumbs up (so cute). Thank you Isa. Another masterpiece!! Try “Coconut Bliss” brand. Vanilla or Naked Coconut flavor. It’s organic. So good it will make you see GOD. is the coconut oil absolutely necessary in the caramel or is there an alternative? i was just wondering because i can’t really afford coconut oil at the moment. thanks! this looks fantastic and not too difficult! When I first saw this posted, I started thinking of everything I could do with the caramel. This weekend I made it sans ginger to make my mom a vegan turtle cake. Yum! I had trouble with the grilling but I used nectarines instead of peaches (they were on sale) so maybe that was the problem. I had them on the grill for a long time and still they were firmer than I wanted. I had to push really hard with my spoon to break it up. However…..the ginger caramel sauce was so awesome! It really reminds me of an Asian dessert that I really like, silken tofu with ginger syrup. So 1) I am going to try using actual peaches next time, and 2) I am totally going to try this with silken tofu. Thank you so so much Isa!!! So excited to make these for my friends tonight and also to share this with the Pinterest universe! The vegan guide to grilling: Do’s & Dont’s « Eat.Plants.Live. This looks rediculously good! Getting some more fresh Georgia peaches at the farmers market this weekend and making it promptly. The caramel sauce is amazing. I’d eat it on anything! 😀 And, as I discovered, it’s even more delicious the next day as it hardens a little. The best breakfast you can get!